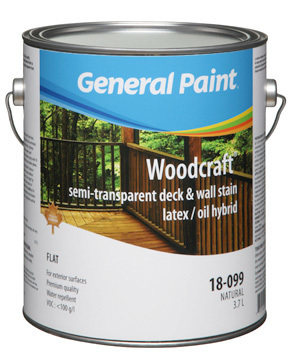 Intended Uses: A decorative and protective water repellent stain finish for exterior wood. Semi-Transparent Stain enhances the natural beauty of the wood. The pigmentation provides protection from the ultra violet light while maintaining the natural colour. Widely used by producers of pre-finished siding. Contains a wax to aid in the repelling of water and durability. Surface Preparation: Wood must be clean, dry (less than 12% Moisture) and free from dust, grease, mildew and wax and not previously painted or varnished. If the wood is weathered or if mill glaze is present an appropriate cleaner should be used or remove the mill glaze and/or dead wood fibres.